In November 2016, the Teaching Schools Council commissioned a review of evidence about current teaching and effective pedagogy of foreign languages at, specifically, secondary school level in Key Stages 3 and 4. The results and a set of recommendations were published in the ‘Review of MFL Pedagogy’, which has been widely discussed in teacher education, OfSTED, and professional network events. The Centre is funded by the Department for Education (DfE) to take forward these recommendations and implement them in schools. Whatever their level of achievement, the vast majority of young people should study a modern foreign language up to the age of 16, and take a GCSE in it. Pupils need to gain systematic knowledge of the vocabulary, grammar, and sound and spelling systems (phonics) of their new language, and how these are used by speakers of the language. They need to reinforce this knowledge with extensive planned practice and use in order to build the skills needed for communication. The content taught through the new language should be stimulating and widen pupils’ knowledge of the culture, history and literature of speakers of the new language, without compromising the necessary sequencing of vocabulary and grammar. Teachers should select textbooks on the basis of how well they support a planned approach to teaching vocabulary, grammar and phonics. They should be supplemented by additional, attractive resources, including ICT and reading resources. Pupils should be taught to pay attention to the detail of meaning through translation, and should extend the range of their vocabulary and understanding through reading short texts and literature. They should have opportunities to interact with native speakers, both in person and through video links. Languages teachers should know and build on the grammar taught in the key stage 2 national curriculum for English. Secondary schools should know about the modern languages taught at their feeder primary schools. Wherever possible, they should support language learning in primary schools and plan to build on pupils’ primary school language knowledge. Teachers should carefully plan their own and pupils’ use of the new language in class to support and reinforce learning, and ensure that meanings are always clear and confusion avoided. All pupils can expect to make mistakes in speaking and writing. Teachers should use errors to inform teaching, helping pupils to pay attention to detail without discouraging them. Spoken and written language are closely connected and overlap. Therefore speaking, writing, listening and reading should be taught together, rather than as separate skills. We recommend two to (ideally) three hours per week of teaching time, spread over frequent lessons of between 40 – 60 minutes duration. A GCSE course should have at least 10% of curriculum time. Where schools are grouping and setting, they should ensure that the needs of all pupils, including those capable of the highest attainment and those with special educational needs, are fully met. In view of the shortage of teachers and professional linguists, it is particularly important to ensure that those capable of proceeding to A level are taught in ways that enable them to do so. Assessment should use a range of tasks, including those focused on specific aspects of the language taught, such as vocabulary or grammar. Some tasks should require pupils to compose sentences, short pieces of writing and oral presentations of their own. Assessment should not make excessive demands on teachers’ time. Mentors should focus on the systematic development of trainees’ subject-specific knowledge and expertise in language teaching. 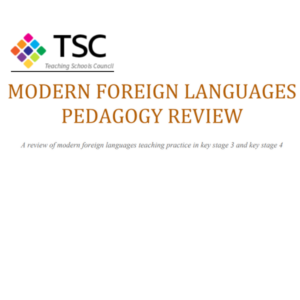 Where schools have complete or shared responsibility for the initial training of modern language teachers, they should ensure that a clearly worked out curriculum is in place, which should include areas covered by this report, in particular the specific pedagogical knowledge and expertise required by language teachers. There should be a review of grading approaches, particularly at A Level.